The largest generation in American history, Millennials are having a big impact on both national and local housing trends. But does it make sense to build housing specifically for them, as one developer wants to do in Wheaton? AVA H Street. All photos by the author. There's been no shortage of writing about Millennials, or the generation of young adults between 20 and 34. 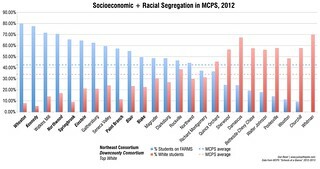 On the one hand, they're flocking to places like the DC area for its strong job market and opportunities for urban living. On the other hand, they're often burdened with student loans and strapped for cash. Nonetheless, developers are responding by building housing designed especially for them. Last month, AvalonBay presented early designs for a new apartment building at Georgia and Blueridge avenues in downtown Wheaton under its "AVA" brand, geared towards young, hip renters who want to live in urban areas. The 325-unit, four-story building would replace a mostly-vacant 1960's-era office building; if approved, it could open by 2016. AvalonBay originally planned to build a conventional luxury high-rise on the property before the Great Recession. 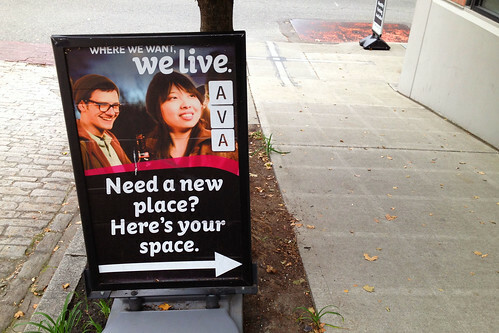 Ad for AVA Belltown in Seattle. Like H&M but for apartments, AVA is designed to cut costs while remaining trendy. It's the result of a 2008 renter survey that identified a group of younger renters who want to live in urban areas, even if it means living in a converted sunroom. Other developers are chasing Millennial renters as well. In White Flint, Foulger-Pratt is working on a mixed-use complex called East Village that will have "smaller, cheaper" living spaces and "authentic" retailers. Developers can be conservative, but their decision to build apartments for the young and hip in traditionally suburban places like Wheaton or White Flint says they're confident about those area's future. These are already two areas in Montgomery County where where Millennials cluster, and hundreds of apartments are being built in both communities right now. But can Millennials actually afford these units? AVA buildings are usually in gentrifying neighborhoods next to more established ones, keeping land costs down, and use wood-frame construction instead of more expensive concrete. Inside, the apartments are about 20% smaller than traditional units and swap out pricey fixtures like granite countertops and hardwood floors for laminate and vinyl. There are only basic amenities, like a exercise room and a courtyard. 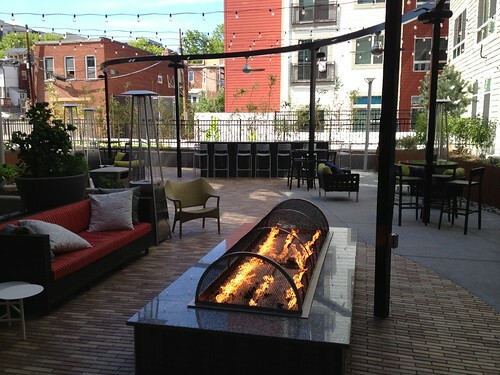 AVA buildings have few amenities, but they're designed for socializing, like this fire pit. 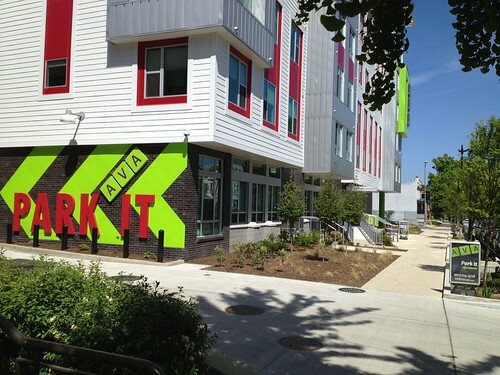 Instead, AVA makes up for it with low-cost but high-impact design choices: bright colors and corrugated metal accents, a wall in the lobby that displays tweets from the neighborhood, and aggressive, cheeky marketing and signage. I visited AVA H Street out of curiosity in May, and for weeks afterward I got automated emails saying "Don't forget about me . . . Seriously, don't." Some of these design features are really smart, like a customizable "gear wall" in the closet. But most of them are pretty superficial and will seem really dated in a few years when tenants "age out" of the buildings. But at least it'll be cheap to redecorate. Besides, the rents are lower: As of this writing, the lowest monthly rent for a two bedroom apartment at AVA H Street is $2380, compared to $3165 at 360 H Street, another new building a block away. That's a relative steal. But even if two roommates split the apartment, paying $1190 each, they'd both need an annual income of $47,600 to meet affordability guidelines. That's out of reach for many Millennials, and even those who could afford it may not want to spend nearly $1200 a month on half an apartment. Of course, AVA and other buildings aren't meant to provide housing for all Millennials, but only those who can personally justify the expense. But building new apartments will increase the supply of housing, gradually lowering prices via filtering for older housing in the area. And that's a good thing for Wheaton or any other neighborhood where AVA arrives. Whether or not they attract and retain Millennial tenants, they'll make the area more affordable for everyone regardless of age. Can the developer of the apartments/condos/townhomes in Hyattsville provide numbers on how well they've done with that community? 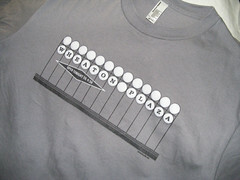 I think that would be telling for any development like this for Wheaton.